Undergraduate humanities students make the rounds at the University of Mississippi Medical Center, observing patients and physicians while getting an up-close look at emerging ethical issues in modern medicine. 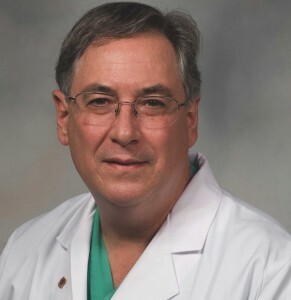 “The idea is to develop a population of humanities scholars who have a meaningful exposure to the modern biomedical enterprise and who will help us better understand health care in a broad sociocultural context,” said Dr. Ralph Didlake (BS zoology ’75), director of the UMMC Center for Bioethics and Medical Humanities, associate vice chancellor for academic affairs, and chief academic officer. 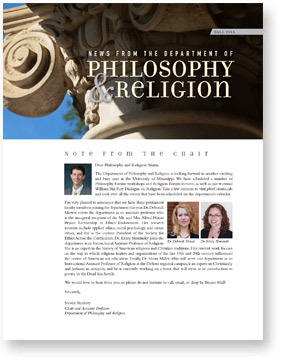 Launched in 2010, the five week Student Fellowship in Bioethics is a collaboration between UMMC and the UM Department of Philosophy and Religion. The immersion experience program designed for juniors or seniors in the College of Liberal Arts introduces the fellows to the real-world ethical issues and challenges that face medical professionals, said Steven Skultety, professor and chair of philosophy. “Much like students in medical school, our biomedical ethics fellows are assigned to ward teams, where they observe patients as they experience their illnesses, the environment in which their care is given, as well as the physicians, nurses and other staff as they provide that care,” Skultety said. Besides interacting with medical and nursing students, the fellows attend selected classes and meetings of review boards, participate in tutorials and small group discussions, and write an essay that analyzes an ethical, cultural, or social issue encountered during the experience. Emma Willoughby, (BA sociology and liberal studies with concentrations in anthropology, biology, and psychology ’14) currently at the London School of Economics for a master’s in international health policy, was a recent bioethics fellow. “I’m very passionate about social disparities in health-care delivery methods and access,” Willoughby said. 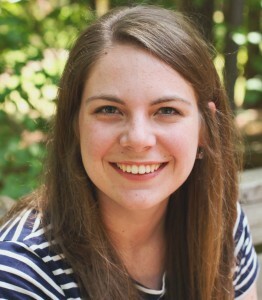 Last June she conducted research for her thesis on trust relationships between patients and staff at a community health center in the Mississippi Delta. “I was learning about trust relationships between patients and providers,” Willoughby said. “At this health center, strong community bonds created a welcoming, nurturing atmosphere. In Jackson, at UMMC, things were very different—the medical system was much larger, more impersonal, and disparities between patients and providers were starkly clear to me. Contextualizing what I had experienced at the Delta clinic in the bigger picture of health care proved to be critically important for my thesis research and analysis. “As we know, health care is linked to many facets of society and therefore requires the input from many different kinds of people, including philosophers and ethicists, economists, psychologists, social workers, policymakers and lawyers, managers, those in marketing, and countless others. But it’s important that these folks are all on the same page about what influences and shapes our health care delivery—socially, politically, and economically—if we really want to improve the health care system we’ve created.